Kellie's Castle is the ruin of a mansion located near Batu Gajah, about 20min south of Ipoh. The abandoned and unfinished castled was built by the Scottish planter William Kellie Smith in the 1920ies in a mix of architecural styles. Gua Tempurung, located 30min south of Ipoh, are the largest limestone caves in Peninsular Malaysia. Ipoh's railway station was completed in 1917 under the British colonial administration. Along with the Old Railway Station in Kuala Lumpur (same architect) it is one of the most beautiful examples of colonial architecture. The heritage trail through the historic old town center is an interesting walk passing many impressive buildings from Ipoh's boom periodic from 1880s to the 1930s. 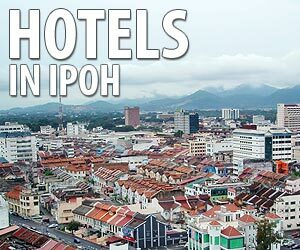 Ipoh Padang - padang means field in Malay - is large field in the city centre lined by colonial buildings. It was set up in 1898 and was used as a cricket field for the British in the colonial days in the early 20th century. The historical clock tower was built in 1909 in memory of James W.W.Birch, the first British Resident of the state of Perak who was assasinated.